The AstroCel® TM Disposable Ceiling Module is designed for optimum filter performance with an individually ducted system for use in laminar and non-laminar flow clean room Class100,000 to 10. The AstroCel® TM Disposable Ceiling Module is hermetically sealed to prevent voids and leaks to meet stringent air quality requirements of clean rooms. It is typically installed in a T-Bar grid system suspended from the ceiling or installed in an AAFAstroDry HD modular ceiling grid. Hold-down clamping is not required.Its low profile, lightweight, and disposable design makes it ideal for usein hospital operating theatres and laboratories, pharmaceutical,microelectronic, film and optical fiberfacilities, food processing plants andother applications where airborne contaminents must be carefully controlled. The AstroCel ® TM Disposable Ceiling Module is hermetically sealed and tested to prevent leakage between hood inlet and air leaving side. All metal to metal joints are bonded to eliminate bypass leakage. 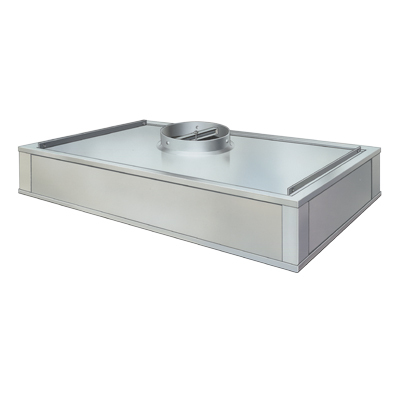 The standard module comes with a 250mm (10") diameter inlet, a fixed distribution plate, an integral round duct connection and a white epoxy coated faceguard on the downstream side to protect the HEPA mini-pleat pack. The AstroCel ® TM Disposable Ceiling Module is made of lightweight anodized extruded aluminum. The low profile and lightweight of the AstroCel ® TM Disposable ceiling Module helps to reduce handling and installation time. H14 HEPA Filter - 99.999% minimum efficiency on 0.3 μm particles. U15 ULPA Filter - 99.9995% minimum efficiency on 0.12 μm particles. All HEPA filers are leak tested. ULPA filters are scanned with a laser spectrometer with PSL particles for leaks, and tested for efficiency and air distribution.